SEO can be one of the most daunting aspects of the small business world in the digital age, which is why we’re bringing you our complete small business SEO guide. If you’re still not really sure what SEO means (even though you’ve heard it many times), here’s a good definition. SEO is a process in which you make it easier for search engines like Google to find your website and show it on their search results pages. That way, if someone is looking for products or services you offer, they’ll be able to find you through search. That’s why SEO stands for ‘Search Engine Optimization.’ You’re optimizing your website so that search engines can show you on their search results pages. I. Why is small business SEO important? V. Short-term or long-term SEO? You may not be 100% sure why this is important at all. After all, 20 years ago no one seemed to be concerned about SEO and small businesses were doing very well. SEO, and specifically small business SEO, helps bring visitors to your website. The more visitors come, the more products or services you’ll be able to sell. The higher you are on the search results pages, the better your click-through rate (CTR), or the percentage of people who actually click on your website, will be. Here’s a chart that shows the differences in CTRs for positions 1-10 on a search results page. As you can see, if your website is in position 1 for a keyword, you’ll get a CTR of 30% (ignore branded vs unbranded for now). This drops to 12% for position 3 and less than 2% for positions 9-10. That means that, if 10,000 people are searching for a keyword every day, if you’re in position 1, you’ll get 3,000 visitors. If you’re in position 9, you’ll get fewer than 200. Assuming your site converts visitors at a rate of 2% (meaning 2% of all the people who visit your site will buy your product or services), you’ll get great sales depending on your position. If you’re in position 1 and get 3,000 visitors per day, with a 2% conversion rate you’ll make 60 sales per day. If you’re in position 9, you’ll only make 4 sales. More specifically, let’s say your keyword is “men’s leather shoes.” We’ll say that 10,000 people are looking for men’s leather shoes everyday. Let’s also imagine that you sell your shoes for an average of $80 for your most popular line of men’s leather shoes. If you are in position 1 (which means you get 3,000 visitors and 60 sales per day), you can make $4800 per day (60 buyers x $80). In position 9, you’ll only get $320—a difference of $4480 each day. This is why SEO is so important. In our small business SEO guide today, we’ll look at everything you need to know to make sure your small business website will rank nicely on the search results pages. First, we’ll need to make sure your website meet standards and is ready for a high amount of visitors. On-site SEO basically means that everything you produce on your website is optimized. After all, if you have lots of visitors, but the quality of your website is low, then you simply won’t make lots of sales. But even before that, the search engines will visit (crawl) your site and mark you down for its speed, low quality, or other factors. Let’s look at the most important things you need to consider first. By far the biggest aspect of your on-site SEO is making sure that you are producing quality, relevant content. Your content can come in the form of blog posts (which are highly recommended) or making your product or service descriptions informative and valuable. Before you begin to create your content, you need to make sure that your content matches with your ideal customer. For example, if you’re selling men’s leather shoes, you need to figure out what kind of person is buying men’s leather shoes? Are they men, or are they women (friends, wives, mothers, etc.) who are buying the shoes for men? Are they modern, young visitors, or are they from the older generation? Your content needs to target your ideal customer. You also need to make sure that you choose keywords and phrases that can actually get you on the first few positions of the search results page. For example, “shoes” will be impractical because you’ll be competing with big names like Zappo’s, Macy’s and others. It will be extremely difficult (though not impossible) to rank higher than those names. That’s why you need to go with long-tail keywords, or the more specific phrases that people will most likely be searching for. “Men’s leather shoes” (which brings 67.3 million results) is longer than “shoes” (which brings 1.8 billion results) and therefore easier to rank for. But “men’s brown leather oxford shoes,” with only 1.6 million results, is even better. You’ll also need to make sure that you are producing high quality content. For example, you can’t just write “men’s brown leather oxford shoes” 50 times over on your page selling men’s brown leather Oxford shoes. Your readers will abandon your site as soon as they get there, and that will send Google the signal that you have low-quality posts. Instead, your page (specifically your blog posts) should be providing some quality information. For example, you can write a post about how to take care of leather Oxford shoes. You could also create a post on how to choose the best leather Oxford shoes for different types of men. This topic will come from your knowledge of what your ideal customer wants to know. Another important thing to note is that Google wants the visitor to have the best experience possible. Having long blocks of text in your blog posts is not particularly attractive, and it doesn’t line up to the increasingly visual society we’re living in now. You should have images throughout your post (images of your own shoes or related to your topic) to help teach your readers. After all, good SEO is pretty much providing good quality to your readers. Google is getting better at determining what is good quality and what is bad quality, and as it grows more sophisticated the good quality will be rewarded and bad quality will be published. So when you’re creating your content, always put the reader’s experience and value first. Video and images will help with that. This may turn some of you off, but it’s important that you help search engines like Google find and identify what your website is all about. It’s one of the most important small business SEO tips, and you’ll need to make sure you cover everything. While this may seem technical, luckily there are lots of programs and software solutions that can help you with this. For example, if you have a WordPress website or blog, you can use the Yoast SEO plugin to help make sure you’re doing all the necessary technical on-site optimizations. Your title tags can best be thought of as a newspaper headline. They tell a reader (and Google) what your page or site is about. When writing blog posts or other pages, the title tag is usually known as H1 (heading 1), which is the largest size font in the blog post. You should only use one H1 (or title) for each blog post or page. It’s also recommended to use subheadings (H2, H3, etc.) in your posts to make it easier to read. Besides your title tags, your meta descriptions are also important. This is what Google shows underneath your title on their search results page. If you don’t create a unique meta description for each post or page, Google will simply take random text from the page. The internet is pretty much a digital space connected by links, much like a spiderweb, which is why the internet is often referred to as the web. Google and other search engines crawl along this web by visiting pages that you’ve linked to. The more links there are, the more Google will be able to crawl your site, and the more pages you’ll have indexed (stored by Google and shown in search results). To make life easier for Google’s crawling programs, you should have a sitemap that tells Google how your website is organized. The Yoast SEO plugin for WordPress automatically creates this sitemap when you set up the program. Although this is a technical aspect, it’s also a user experience aspect. If your website takes a long time to load (5 seconds, for example), your visitors will likely abandon your site. The faster they abandon your site, the lower Google will rank you. Increasing your site speed is very important, especially in such an always-online world. This is because many (at least half) of your visitors will be visiting your site through their smartphones. That’s why you need to optimize your images so that they aren’t too big and make your website simple, fast and easy to navigate. Another important thing to consider is making sure that your keyword is actually stated in the URL. For example, if your topic is “How to Maintain Men’s Leather Shoes,” your URL should not be yoursite.com/0154654321 or yoursite.com/maintain. Now that you’ve got your house taken care of, it’s time to advertise all the great content you’re producing. After all, if you have a restaurant with delicious food, beautiful rooms and amazing atmosphere, but no one knows about it, you probably won’t get too many visitors. You could be passive about it and wait and hope that someone will come and discover you and then spread the word. But that can take a long time and is not a good, dependable SEO strategy. So now let’s look at what is important to do and know outside of your own website. The authority of your site is a huge factor in determining how high (or how quickly) your page or posts will rank in search results. Thi s is usually determined by how many websites are linking to your website (specific pages or the website in general). Generally, the more (quality) links, the better your authority is. There are many ways to determine your website’s authority. Some time ago, Google had its own metric called PageRank, which showed how important or authoritative your website was. It was scored from 0-10 and showed how important Google viewed your site. It is now discontinued. Moz has metrics called Domain Authority (DA) and Page Authority (PA) from 1-100. DA shows how authoritative your entire website is, whereas PA showed the authority of one single page or post. There’s also Ahrefs Domain Rating (DR) and URL rating (UR) from 1-100 which are similar to Moz’s. Both the Moz and Ahrefs are approximations of the authority of your site. Bounce rate also affects your ranking. The bounce rate is simply a measurement of the percentage of people who only visit one page on your site. For example, if 100 people visit your post “How to Maintain Men’s Leather Shoes,” and 30 visit another page on your website but 70 people leave once they finish the post, then your bounce rate will be 70%. In order to seem more authoritative in Google’s eyes, your content has to be interesting. In order for them to see how interesting your content is, they’ll want to see a good bounce rate and a long time on page. For example, if your visitors spend 10 minutes reading your first post then click on other pages, with an average of 7 minutes for each page, then that means your content is really engaging. However, if they spend only 5 seconds on your pages, then it couldn’t be very interesting at all. I already discussed the CTR above, but it is quite important to go deeper into this topic. CTR is said to be one of the most important factors that determine how high Google will rank your site. The exact ranking factors are obviously not known, but the most important ones are listed in this small business SEO guide. CTR seems to be one of them. In one experiment on Moz, Rand Fishkin sent out a tweet asking his followers to help him with an experiment. He asked them to search for “IMEC Lab” in Google and click on his blog in the search results. What he found that his blog was in position 7 at 6pm, and by 9pm it had shot up to position 1. That implied that searching for a phrase and then clicking through on it will help rank a site higher in Google. Google’s PageRank that I mentioned above was pretty much based on determining how important your site is by how many other sites link to it. Although this is only one of the many ways that search engines now determine the authority of your website, it is still a very important part. In order to get better positions in the search results pages, you’ll need to make sure that other websites are linking to your site. One of the first and most popular ways to build links is by writing guest posts for other (larger, more authoritative) websites. The purpose of guest posting is two-fold: gaining traffic and improving your ranking. While the second purpose is not loved by search engines, it is still very important. If you have knowledge of your niche and related niches, you can find many websites and blogs that would love your guest posts. For example, for my imagine men’s leather shoes website, I can write on fashion blogs, business blogs, ecommerce blogs, and many more. It is important to reiterate, however, that the quality of the sites or links are more important than the quantity. 1,000 links from a spammy site will never be as good as 1 great link from The New York Times, for example. The text that is being linked (in blue here) is called the anchor text. The last three types are all recommended, and you should switch up which ones you are using on your guest posts. The first one is not recommended, as it does not give any information about what the website that your linking to is actually about. It is too generic. Social media seems to be playing an increasingly important role in SEO. Although it does seem to be a bit of mystery on the official position of Google, websites with better social signals often do better. Social signals are the amount of shares, likes and other social media visibility that search engines can see. If no one likes, comments on or shares your posts, then you’ll have no social signals for that page. It is logical that Google and other search engines will look at social signals, like social shares, to see how popular (and therefore valuable) one of your posts or pages are. 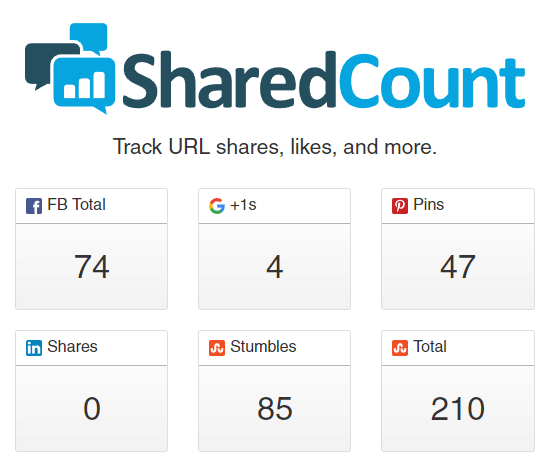 Social shares seem to be important for increased rankings. You can check social shares here. If you get 1,000 shares in the span of 10 days, it sends a huge signal to the search engine that you have viral content. Because search engines want to present the best, freshest content to the users, it will rank that particular viral post higher. If the trend continues, and you get a good amount of social shares and other social signals, your page will rank higher. There is one important thing to note about social shares, though. Because of human nature and the desire to do things faster, there is a lot of spam online. You can buy thousands of social shares from sites like Fiverr for roughly $5. However, this is not going to get you ranking high on the search results pages. That’s because those social shares will come from fake accounts that have only one purpose: to share, like, visit pages and do other automated tasks. The quality of those accounts is extremely low, and you may even be penalized by Google for it. Therefore, if your posts are shared by influential social profiles (what’s known as an influencer), then that will have more value. In this way, social signals are similar to links to your website. While we are talking about SEO, it’s also a good time to talk about different approaches to SEO. One is white hat, which is working within the guidelines presented by search engines. The other is known as black hat, which is pretty much based on manipulating factors in order to improve the position in the search results pages. This can best be thought of as the slow game. In white hat SEO, you are following the search engine best practices guidelines. In that sense, if you follow the points listed in this small business SEO guide you’ll be using the white hate strategy. It is simple in that it doesn’t concern itself with rankings at all. A good SEO strategy is a user-focused strategy. If you care about your visitors and work to give them the most valuable experience, then you’re doing well. You are also protecting yourself from Google’s updates and penalties, which have a goal to improve search results and penalize those trying to manipulate it. These penalties can include specific pages or entire websites being deindexed (permanently removed from Google’s search results). There are many reasons why you should avoid black hat SEO, which uses bots, software and even hacking to increase search rankings. For one, it can get quite complicated and even expensive with many tools and programs you need to use everyday. Secondly, it is focused on a short-term plan: get as much money as possible in a short amount of time until Google finds and penalizes the site. However, the most offensive part of black hat SEO is that it is largely based on low quality, low value sites. It provides value for no one and is only meant to fool the ever-evolving search engines. It is only a matter of time before those sites are penalized and are erased from search forever. There’s no reason to put your website and your business in such great risk, so you should avoid black hat SEO practices at all costs. The most important thing to remember about your small business SEO is that SEO is not a goal, it’s a process. SEO is not a goal, it’s a process. You don’t reach your goal of X amount of sales or traffic and then stop doing SEO. That just means that other sites with proper SEO practices will rank higher and push you further and further down. No, SEO is in the way you publish information and get attention for your posts and pages. The results of (white hat) SEO may seem slow, but it is crucial for establishing yourself. With proper small business SEO, you will find that you’ll slowly gain more and more visitors for a longer period of time. And with more traffic, you’ll get more sales and help boost your small business.